In this paper we show how the formal framework introduced in PAMR (Process Algebra for the Management of Resources)can be included into a notion of Extended Finite State Machines (in short EFSM). First, we give the definition of process. Following the lines of PAMR ,a process consists not only of information about its behavior but also of information about the preference for resources. This information will be encoded into a model based on EFSMs. In contrast with the original definition of PAMR, a notion of time is included in our processes,that is, transitions take time to be performed. Systems are defined as the composition of several processes. We present different implementation relations, depending on the interpretation of time, and we relate them. Finally,we study how tests cases are defined and applied to implementations. Research supported in part by the CICYT project TIC 2000-0701-C02-01. This research was carried out while the first author was visiting the GET-INT. He would like to thank Ana Cavalli for helpful discussions on testing and for her financial support under the Platonis project. M. Núñez and I. Rodríguez.PAMR:A process algebra for the management of resources in concurrent systems. 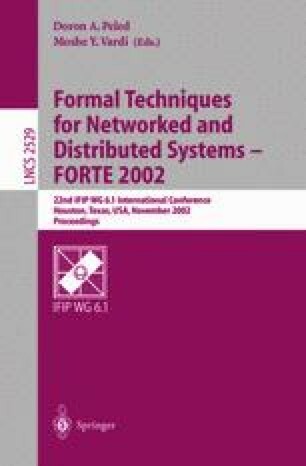 In FORTE 2001,pages 169–185.Kluwer AcademicPublishers,2001.An extended version of this paper is available at: http://dalila.sip.ucm.es/~manolo/papers/pamr.ps.